In my last column I argued that political ideologies are by their nature too broad to be instructive, and hence they are not efficacious. In this column, I want to explore whether or not policy viewpoints, which in contrast to ideologies are narrow and specific in terms of proposed governmental actions, are efficacious. 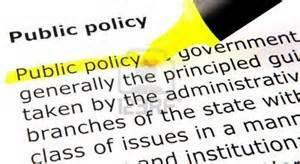 But the word policy as used by politicians, scholars and students in everyday discussion connotes a broader meaning. In accordance with this broader meaning, policies embody large-scale plans and core principles. Hence, we use terms like “foreign policy,” “environmental policy” and similar terms to mean intellectually conceived and consistent measures to be taken in pursuit of given ends. Politicians stand for or against hosts of such policy perspectives. Schools of public policy promote a noble view of policy, proclaiming that more enlightened policies will produce a more enlightened world. In this context, the idea of policy is unabashedly idealistic. Policies are the building blocks with which a better world is to be built. In this view, the adoption of policies based on scholarly research and analysis, and implemented by policy-trained professionals will prove transformative of a world short of such policies. It is tempting to hope that policy choices not yet on offer might elicit political consensus and produce happy results. But this is wishful thinking. There are no shortages of policy options or information. There are only shortages of political consent to implement them. By way of proportion, we are in possession, literally, of tons of policy proposals for every ounce of political consent. Moreover, political consent is ever subject to reconsideration. There can be no such thing as a long-term policy without long-term political consent. Clearly, unarguably, politics is primary and policy is deeply and permanently subordinate. If we want our institutions of government to obtain better and lasting results through better policies, we must first obtain lasting political consent for those policies. Unfortunately, the practice of politics is about the present, not the long term. The political arena’s controlling time frame extends from the last election to the next one. Politicians rightly feel a sense of triumph when they can produce political consent in the present moment. Lasting political consent would be orders of magnitude more difficult to obtain. Moreover, politicians would derive no reward for obtaining lasting political consent. The elections of the long-term future are too far off. No one has a clue what will motivate voters two or more elections from now. Further complicating the picture, expressions of political opposition to other people’s policy views often serve better at election time than expressions of support for one’s own, as do expressions of dislike and even loathing for those who hold offending views. Political realities, then, are by and large incompatible with the virtuous policies we desire. We find it dispiriting, not elevating, to cast aside well-formulated, intellectually rigorous policy proposals for political compromises that invariably replace prized provisions with tawdry concessions. It is all but impossible for those committed to intellectual policy persuasions to appreciate political compromises that produce unworthy policy outcomes. No politician can measure up to the policy ideals he stands for. We do not see, and are incapable of seeing, compromises to our policy views as virtuous. We see compromises and accommodation as political malpractice and treachery. Instead of serving as helpful ideals, our notions of policy serve as constant reminders of how our political adversaries obstruct what is self-evidently right and virtuous. Being for what is right and virtuous, we stand against compromise. The more we value policy outcomes, the more we deprecate processes of accommodation. Despite the undeniable fact that the conduct of politics and elections does more to tear down than build lasting political consensus, it remains the case that there is abundant lasting consensus among the American people with respect to many, and perhaps even most, subjects of political contention. We are constantly, and wrongly, told that our political dysfunction is no more than reflective of the American people’s views. Our political dysfunction is, in truth, a reflection of the political weakness of those who support views reflective of lasting consensus and the political strength of those who stand against those views. We would have happier politics, and a happier and more successful country, if we subordinated our policy persuasions and passions to working things out with, instead of triumphing over, those whose policy views differ.